I’ve read this book a number of times now, but every time it has me from the first sentence: “There was once, in the country of Alifbay, a sad city, the saddest of cities, a city so ruinously sad that it had forgotten its name.” After that, it’s all over for me. I can’t put it down until I finish every last word of it. It’s a beautiful story, woven together from Rushdie’s finest skills of wordplay and imagination. Someday, when I finally get to teach a magical realism course, I’ll either start or end the quarter with this novel. Not only is it absolutely magical, but it’s also rife with the political mission so much of the genre concerns itself with. 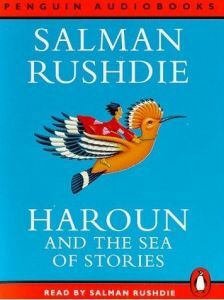 While Haroun and the Sea of Stories is certainly closer to fantasy than much of the magical realism I read, it’s such a powerful story that its flights of fancy make it even more meaningful. As I learn more about the context surrounding the writing of this book, I continue to discover new meanings to add to the other meanings I’ve already caught onto in previous readings. For example, I always wondered about the possible connections between the Valley of K and the nations in our world, but I was never able to make the connection between the Valley of K and Kashmir (despite the now-rather-obvious-seeming discussion of its nicknames — Kosh-Mar and Kache-Mer — on page 40). However, now that that connection has been made for me, I’m able to see all sorts of other significances popping up off of the page. The really fun thing about this book is that there are these real-life political meanings that connect concretely to histories and politics in our own world (like the K/Kashmir thing), but there are also so many other connections that revolve around ideas and questions that, while perhaps no overtly political, bear significant political implications. The recurrence of the question, “What’s the point of stories that aren’t even true?” speaks to a functionalist tendency in our world today that threatens all manner of important things: creativity, imagination, critical thinking/questioning, etc. One example I can think of that is particularly relevant in contemporary America is the devaluation of the Humanities in colleges and universities around the country. While the scientific and technological fields most certainly have very obvious functions within our society (especially when it comes to making money and therefore gaining influence), the less obvious nature of the values the Humanities have to offer have resulted in the growing dismissal of these fields in the American academy. Rushdie’s novel offers a well-imagined and dark look at what can happen to a world and its inhabitants when the balance between imagination and functionality is lost. For anyone looking for a quick but interesting, thought-provoking, and fun read I hope you will consider reading this novel. It’s a great introduction to Salman Rushdie as well, and will stimulate parts of your brain that you might not have used since childhood. Filled with Seussical passages (“The ship’s entire power supply was cut off at once: stirrers stopped stirring and whirrers stopped whirring; blenders stopped blending and menders stopped mending; squeezers stopped squeezing and freezers stopped freezing; poison-storers stopped storing and poison-pourers stopped their pouring” ) and fascinating characters (Water Genies, Plenimaw Fishes, the Walrus), Rushdie’s writing will make you ponder without realizing you’re doing it. Let me know what you think when/if you read this!